Japan America Society of Southern California - Iron Chef Sakai LIVE! Enjoy a gourmet dinner prepared by French Iron Chef Sakai, who appeared on the original TV show Iron Chef and Executive Chef Jonathan Wood of InterContinental LA Century City at Beverly Hills! Iron Chef Sakai will prepare three courses of the dinner and Jonathan Wood will work side-by-side with Iron Chef Sakai to prepare two additional courses. Master Pastry Chef Orlando Maldonado will collaborate with Iron Chef Sakai to create the dinner’s dessert. Tickets are limited to 230 and the cost is $450. The dinner event is presented by Nitto Tire U.S.A. Inc. and the InterContinental LA Century City at Beverly Hills. American Airlines is serving as the event’s official airline sponsor. Proceeds will benefit the Japan America Society of Southern California. Pro bono communications services generously provided by GolinHarris. Iron Chef is a popular television cooking show produced in Japan by Fuji Television Network, Inc. “Iron Chef Sakai LIVE” will be Fuji Television’s first-ever official Iron Chef event outside of Japan and guests will enjoy this once-in-a-lifetime dinner experience. As each of the six courses are prepared, large screens will air live video of Iron Chef Sakai in the kitchen. Chef Sakai will also greet guests and introduce each course. 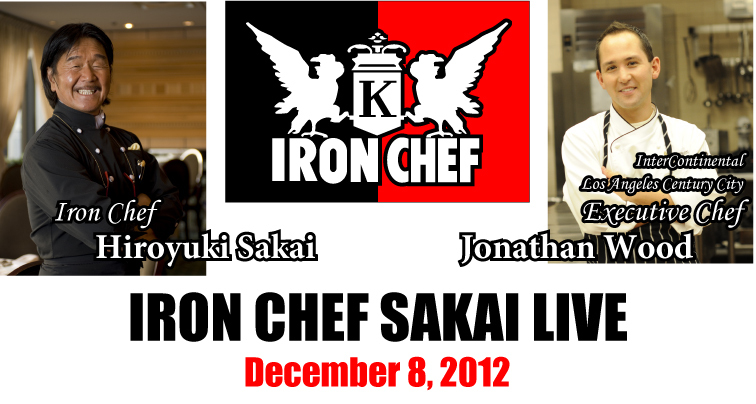 For more information, to make reservations for Iron Chef Sakai LIVE, or to learn about sponsorship opportunities, visit www.jas-socal.org or call Kay Amano at (213) 627-6217, ext. 207.